Our relationships with our customers are important to us and that is why your confidential user information will be well protected. Your name, shipping address, telephone number, credit card information, and e-mail address will only be used to manage your account, process orders, or notify you of special offers/promotions. If you need to change your personal account information, you can do so via our user profile page at http://www.adsoftdirect.com/index.cfm?page=profile. This is the web site of AdSoft Direct, Inc.
We can be reached via e-mail at support@adsoftdirect.com or you can reach us by telephone at 925-407-3101. This Policy is effective on 1/1/2014. During our normal course of business, AdSoft Direct collects the domain name and e-mail address (where possible) of visitors to our Web page, the e-mail addresses of those who post messages to our bulletin boards, communicate with us via e-mail, or make postings to our chat areas, and we collect both aggregate and user-specific information on what pages consumers access or visit. Additional information we collect may be volunteered by the consumer, this includes survey information and/or site registrations, names and addresses, telephone numbers, fax numbers, and payment information (e.g. credit card numbers and billing addresses). The information we collect is used to improve the content of our Web page and customize the content and/or layout of our page for each individual visitor, used to notify consumers about updates to our Web site, shared with agents or contractors who assist in providing support for our internal operations, used by us to contact consumers for marketing purposes, and sometimes shared with other reputable organizations to help them contact consumers for marketing purposes, disclosed when legally required to do so, at the request of governmental authorities conducting an investigation, used to verify or enforce compliance with the policies governing our Web site and applicable laws or to protect against misuse or unauthorized use of our Web site, and may be shared with a successor entity in connection with a corporate merger, consolidation, sale of assets or other corporate change respecting the Web site. With respect to cookies: We do not set any intrusive cookies. If you do not want to receive e-mail from us in the future, please let us know by sending us an e-mail at the above address, calling us at the above telephone number, writing to us at the above address, or visiting us at http://www.adsoftdirect.com/index.cfm?page=profile. From time to time, we make the e-mail addresses of those who access our site and our customers available to other reputable organizations whose products or services we think you might find interesting. If you do not want us to share your e-mail address with other companies or organizations, please let us know by calling us at the number provided above, e-mailing us at the above address, writing to us at the above address, or visiting us at http://www.adsoftdirect.com/index.cfm?page=profile. If you supply us with your postal address on-line you may receive periodic mailings from us or other reputable companies with information on new products and services or upcoming events. If you do not wish to receive such mailings, please let us know by calling us at the number provided above, e-mailing us at the above address, writing to us at the above address, or visiting us at http://www.adsoftdirect.com/index.cfm?page=profile. Persons who supply us with their telephone numbers on-line may receive telephone contact from us with information regarding orders they have placed on-line, new products and services or upcoming events, or may receive telephone contact from other reputable companies. If you do not wish to receive such telephone calls or to be placed on our do-not-share list, please let us know by sending us e-mail at the above address, calling us at the above telephone number, writing to us at the above address, or visiting us at http://www.adsoftdirect.com/index.cfm?page=profile. Customers may prevent their information from being used for purposes other than those for which it was originally collected by e-mailing us at the above address, calling us at the above telephone number, writing to us at the above address, or visiting us at http://www.adsoftdirect.com/index.cfm?page=profile. Upon request we provide site visitors with access to unique identifier information (e.g. customer number or password) that we maintain about them, transaction information (e.g. dates on which customers made purchases, amounts and types of purchases) that we maintain about them, communications that the consumer/visitor has directed to our site (e.g. e-mails, customer inquiries), and contact information (e.g. name address, phone number) that we maintain about them. Consumers can access this information by sending us e-mail us at the above address, calling us at the above telephone number, writing to us at the above address, or visiting us at http://www.adsoftdirect.com/index.cfm?page=profile. 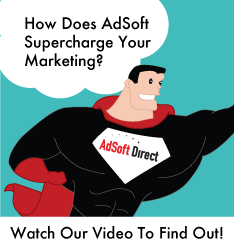 Consumers can have this information corrected by sending us e-mail at the above address, calling us at the above telephone number, writing to us at the above address, or visiting us at http://www.adsoftdirect.com/index.cfm?page=profile. With respect to security: When we transfer and receive certain types of sensitive information such as financial or health information, we redirect visitors to a secure server using trusted 128-bit encryption technology. We also have appropriate and extensive security measures in place both online and in our physical facilities to protect against the loss, misuse or alteration of information that we have collected from you at our site.